Download Your Free Green Spring Cleaning with Essential Oils eBook! Download Your Free Green Spring Cleaning with Essential Oils eBook. What essential oils should be in your spring cleaning kit? What items in your kitchen can you use to make simple & easy green cleaners? What essential oils can keep your home healthier? Why is green cleaning a good idea? 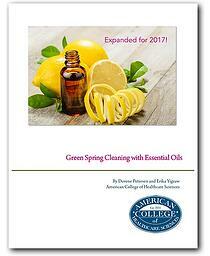 Download your free copy today: Green Spring Cleaning with Essential Oils written by ACHS President Dorene Petersen and ACHS CIO Erika Yigzaw!